You'll see gorgeous scenery everywhere you go but here are some hidden treasures away from the main visitor centres. Don't forget, the Park is 250 square miles in total so plan how long it will take to get there and back. Note - the map references relate to OS Explorer Map OL42. As you enter Kielder Water & Forest Park on the C200 you’ll come to the turning for Elfkirk viewpoint on your left. Not to be missed this spot provides a beautiful view over Whickhope inlet and the Dam. One of the forest’s most beautiful and secluded valleys - also features unique suspension bridge. Without giving away the surprise, here you will find a memorable waterfall, gorge and scenery. Please note this walk is started from the Blakehopeburnhaugh picnic site, 12 miles north east of Kielder Castle on the Forest Drive toll road at the Blakehopeburnhaugh picnic site. Bakethin Dam and Bakethin Reservoir are at the north west end of Kielder Reservoir. The dam was built to prevent unsightly mud flats forming, which would have occurred when water levels are low in Kielder Reservoir. Bakethin Weir is 165 metres long with a 12.5-metre high weir of sand, gravel and rock which keeps the two bodies of water separate. Keeping the water at a constant level at Bakethin Lake has created a nature reserve - a Northumberland Wildlife Trust conservation area for local plants, birds and other wildlife including otters, one of the Kielder Super Six. Your first view of Kielder Water will always be one you remember. 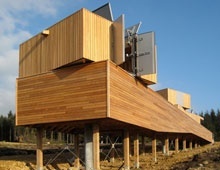 Both pieces in the Kielder Art and Architecture programme offer stunning views over Kielder Water. For more information go the art and architecture page under 'Things to do'. A beautiful place to stop and admire the view, off the Lakeside Way. Part of the art and architecture programme - turn these chairs for whichever view you choose. The site of the now vanished coal mining village. Sited at Benny Shank on the north shore of Kielder Water this unusual but striking shelter which is part of the art and architecture programme is open to visitors at all times of the year and gives a different view of the reservoir. An isolated stand of Scot's pine. Offering great views of the reservoir and the dam you can also experience Wave Chamber. Within its dark interior, the walls echo the wave sounds. An image of the water is projected onto the chamber floor and the floor appears to become liquid. The image is clearer on late afternoons and sunny days. A short stroll from Kielder Village along the trackbed of the former Border Counties Railway, the viaduct is one of the best preserved examples of a 'skew-arch' bridge in this country. It sits above the point where the North Tyne enters Bakethin Reservoir and is a great spot for seeing a variety of bird life. The Lakeside Way route crosses over the viaduct. Find out more about the viaduct here. A stunning 2.5 mile walk through the countryside, passing the remains of an old ironworks and ends at a magnificent 30ft waterfall.